Last week, the Maryland Department of Natural Resources reported big problems with Upper Bay oysters. As part of a Bay-wide survey, biologists collected samples from 15 individual oyster bars north of the Bay Bridge. In the four northernmost bars along the Eastern Shore, oysters suffered a cumulative mortality of 79 percent, with no live oysters on the two northernmost bars. The few live oysters that were found in upper Bay bars were in poor condition — bloated, watery and translucent — and mortalities may continue for some time. Biologists believe the high mortality was caused by the lack of salinity in the upper Bay from March through July, 2011. During that period many modern day records were broken for high flow and low salinity. The demise of the oyster population is very bad news for the Bay, but we haven’t heard much about another part of the equation. Freshwater runoff from upstream flooding caused by Hurricane Irene and Tropical Storm Lee sent already-depleted bait schools packing toward warmer saliter water down south earlier than normal this year. 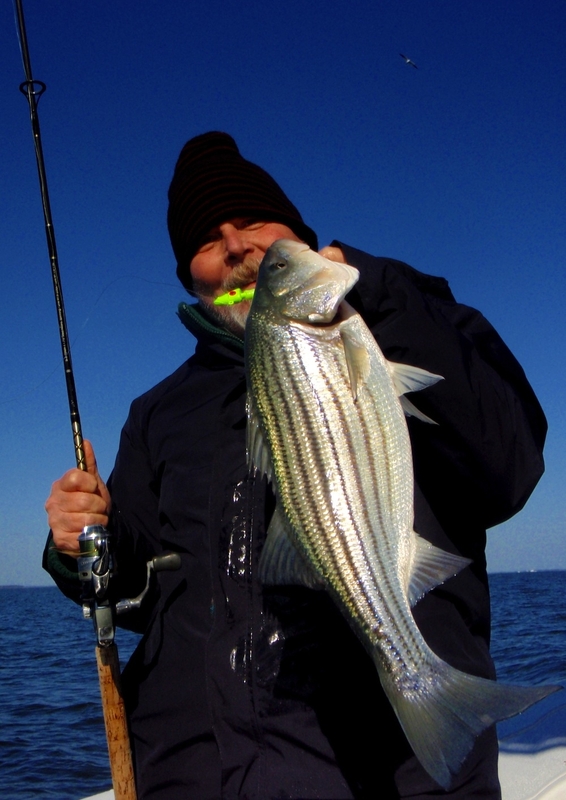 This had a drastic impact on striper fishing. No bait equals no fish. 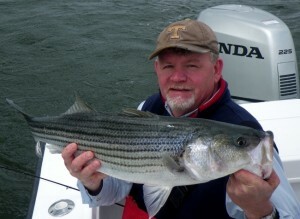 If you’ve kept up with my reports you know that I believe early fall stripers come into the Bay through the C&D canal. That usually brings us big fish in October and November. 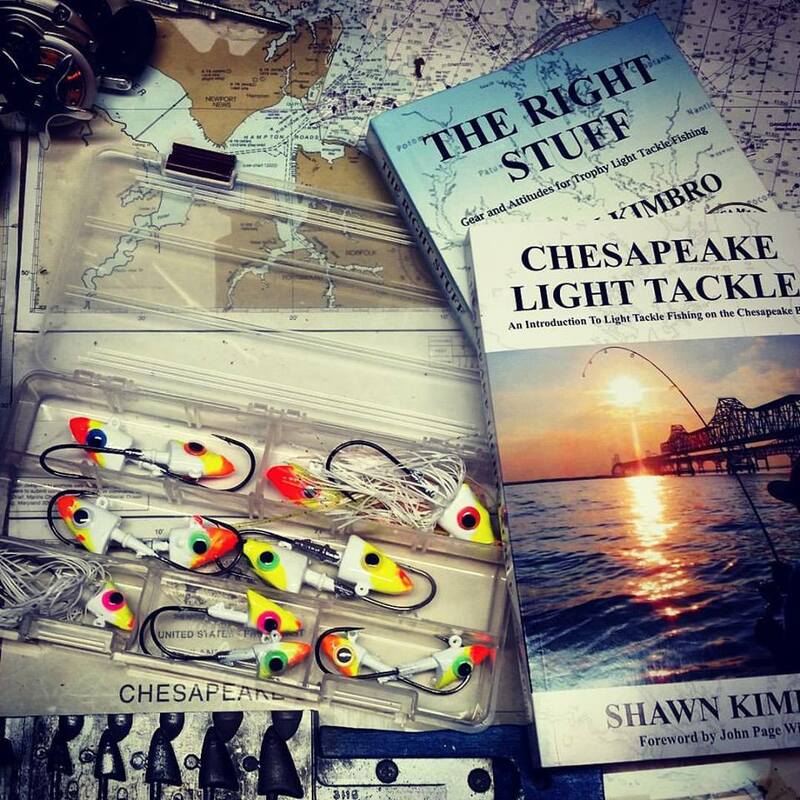 I think they came in this year as usual, but instead of stopping to feed at traditional spots like the Knolls, Man-O’-War Shoals, Swan Point, and the mouth of the Chester River, they just kept right on trucking down the Bay. Some stopped for a while a t places like the Kent Island Sewer Pipe and The Bay Bridge, but they didn’t stay long. Like most of my fishing partners in this part of the Bay, I’ve been struggling to find quality rockfish. In fact, it just hasn’t seemed worthwhile to look for them lately and I’ve only been out three times in the past couple of weeks. Each time I found fish, but not the 30 and 40-inchers I’ve had in November’s past. I fished a couple of days last weekend. I got out Friday evening with Mark. 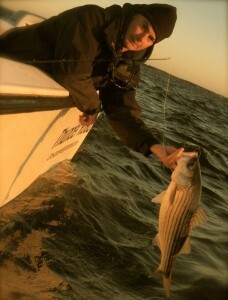 We found plenty of birds working very small stripers, but didn’t hit keeper fish until 20-minutes before dark. I went back the next day with Brian and Marty. We headed south to the mouth of the Choptank River, and found some mid-20-inch fish right away, but the bite didn’t last long and we spent most of the afternoon running from one dink school to another wishing for bigger fish. This past weekend I got out once and ran all the way from Kent Island to Calvert Cliffs, stopping at every hotspot I know along the way. I only hit one or two schools of keeper size fish although, once again, there were birds and little fish all over the place. My fishing buddy Jamie has made a few more trips than me lately. He usually fishes the Mid-Bay and he is occasionally turning up some “overs,” – th at is to say, fish that are over 28- inches long. He’s also managed to squeak out some fish over 30-inches as well. I don’t want to speak for him, but I think he would also tell you that fishing is tough this fall and he’s had to look around to find the bigger fish. I’m still holding out hope that we will get some big migratory schools up from the south. There have been a few big fish picked off trolling, but most of those are well to the south where the water is saltier and cleaner. 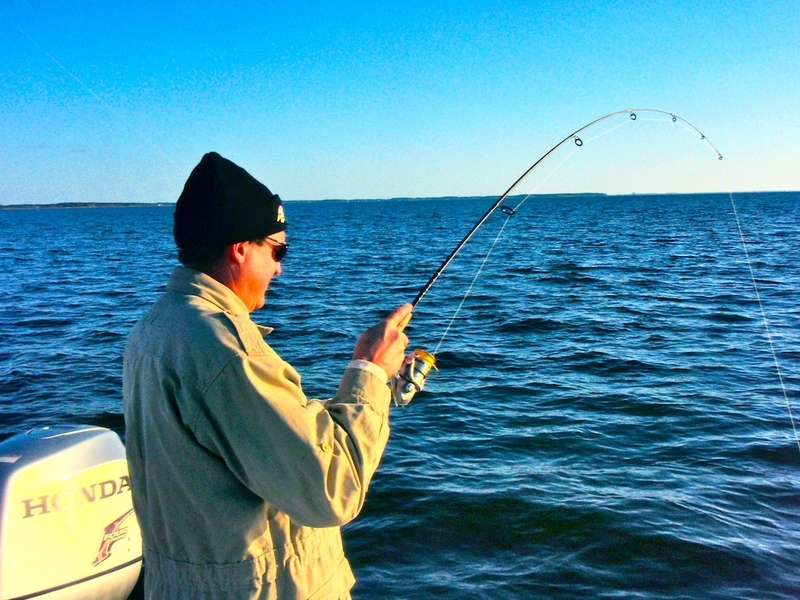 Since the Bay has turned over and water temperatures are about the same top to bottom, the fish can be at any depth. I’ve found them in 10-feet and in 60-feet and they can be feeding on top or right down on the bottom. There are still a few fish feeding along the shorelines as well. They can be caught on topwater, especially during the mid-Day when the sun warms the shallow water. Water temperatures are still in the mid-50s in the open areas of the mid-Bay. That’s a little warm for this time of year. Colder weather in the forecast should drop water temps considerably and (fingers crossed) bring some big fish farther north. Let’s hope so anyway! I am somewhat happy to hear that The Man himself is not tired from draggin’ in a bunch of “overs” because I’ve been struggling this Fall. A couple days ago my friend WOULD NOT remove a 12″ BKD from his line. He wanted a big fish and nothing else but unfortunately we only caught one small fish all day. Birds and bait were sparse and scattered. On another note, I am glad to add the Kent Island sewer pipe to my small list of spots to fish on the Bay. I have no problem with fishing there! Blue Plains Water Treatment plant, and spots around it, on the Potomac are some of the most reliable bass fishing spots I know. And the MD state record largemouth was caught very near there. Those water treatment pipes put out very clean water…most of the time. That’s the key. Good fishin’ to you! coconut charlies top fish for nov12th tourny was 47 inchs, second place was 37,47 above the bridge . Shawn, I think your theories are right on it…This has been a tough fall for me as well..I burned more fuel in the last 2 days than I have ever burned..still only had 1 pretty good day and 1 below average day for what you would expect on Nov 15 and 16..2 years ago today I got my personal best and last year same day had quite a few mid to upper 30’s fish…hoping for a late run as I have seen in years past..usually around thanksgiving..did have a school of menhaden around the boat tues so thats a good sign..great write-up..see ya soon..
Well Michael, I guess I have to wonder if the winning fish killed in that tournament was one of the 45-inchers me or my light tackle partners released last year. A 47-incher is a good fish in anyone’s book and I congratulate the captain of the boat on which it was reeled in. I’ve only been lucky enough to catch five stripers by casting in the past three years that were 47″ or larger. 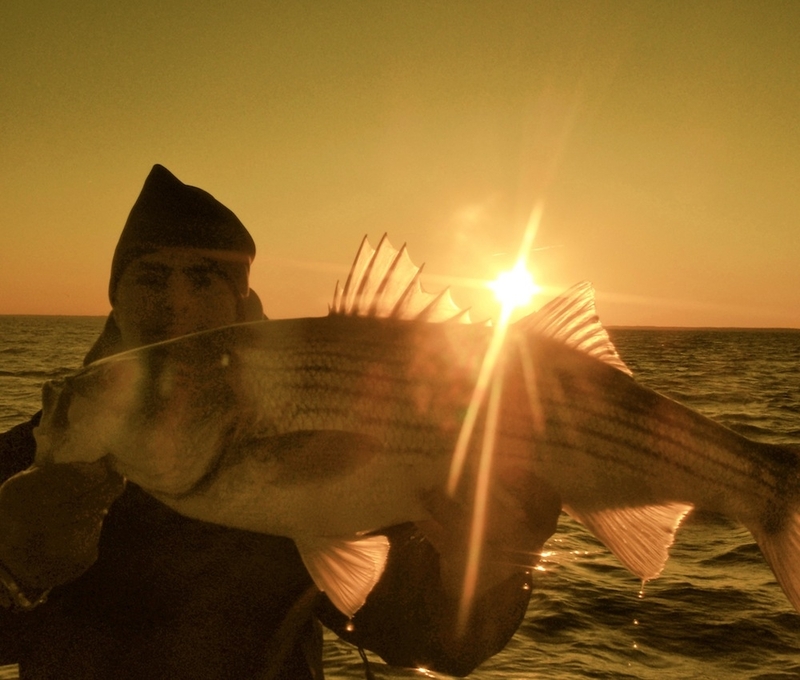 One came two years ago in the Chester River, so I know the potential of the Upper Bay in November. Let’s hope we all get lucky and catch a big fish from time to time, but it’s very discouraging to hear that the second place fish in a November tournament was only 37-inches. As you probably know, that was a routine fish in the Upper Bay last year. My nephew Jake caught three bigger than that on one afternoon. It was his third time with a jigging rod in his hand. No way that would happen this year because the Upper Bay has really been OFF. Excessive freshwater flooding, big menhaden kills, over 3 tons of dead stripers in an abandonned gill net — that’s a bad combination. Even though it may be asking alot I’m hopeful, too, that dropping water temps will bring in some big fish. Only one way to find out. Keep on fishing. Good luck to everybody. We’ll need it. Daniel, that’s ok we have the technology to make more. Hope to see you out here for those big cold weather fish. Just keep a watch on that heater. p.s. Also remember that in those big money “Catch and Kill” tournaments, the only ones who really win are the sponsors. And they (i.e. the few) profit by exploiting resources that belong to everyone (i.e the many). Well put Mark..pretty ironic the same people that preach “conservation” have a 250 boat catch and kill tourney?….”Amazing”…twice a year..
Sure pal keep believing that..
Broomstick brigade, I like that..meat fleet was the “term” I used before..
Good report and a fine read. It had indeed been a poor fall, and I think that the lower salinity may also have something to do with it. I’ve been finding fish of late too, but those fat footballs we were getting two years ago are few and far in between. I like the photo of the fish with the sun in the background. Good work! Shawn,I agree -Too much fresh water is part of the problem.The only thing that seems to be thriving in the UB thus far is catfish. Well said About the Meatfleet Tournaments. Allowing the killing of these big fish before they have a chance to spawn is just plain stupid. I’ll be up soon. We’ll have an ole fashioned, whiskey-fueled carpet burner. Apologies again to the ‘adler and her fine crew. In years past, this would be the time when I’d fish the Susquehanna, throwing bucktails with pork rinds. Some years it would be really good. Not even thinking about it this year, everything washed away! Enjoyed your talk last night, and am excited about the cold weather fishing ahead. Big fish have been a problem this November. My only reference is what I have read and been told since this is only my second year of chasing the winter fish. I’m not disappointed yet, still confident. No doubt they aren’t there as in years past. But I don’t know what I don’t know. What’s with this, “Enjoyed your talk last night” business? Thanks for the invitation I never received (sarcastic grin). I have a couple of buddies that would come along to hear what you have to say about striper fishing. We don’t want to have to stalk you at your local boat ramps just so we can exchange a few fishin’ stories. Seriously though, how do we find out when you’re giving a talk? Sure would appreciate some info. I should do a better job publicizing my talks. My next one will be December 6 in Annapolis. This one is a big deal because it’s the kick-off meeting for the CCA Annapolis chapter and I the first place I plan to offer my book for sale. I’ll say more about the book in a CLT post next week. I might even drive over the bridge for that one. I’ve heard that the book is great, of course you are the one that told me that. Regardless, congratulations on the book, I’m sure it will be a huge success. My fishing team released every fish we caught in the MSSA fall tournament and so did many others. There is a pro-release movement building within the trolling community as we speak. I noticed that, Keith. I think what you guys are doing is great. The next step is a tagging program for these released rockfish. The fish that won died. How can the major sponsor be elible to win the major prize?